Roger Thomas was born in Los Angeles, California in 1951. 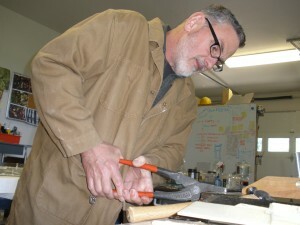 He began working with stained glass in the 1970s, and by the 1980s was developing his own innovative techniques with fused glass. After moving to Portland, OR to take a job at his favorite glass factory in 1988, he established his second studio and began to “make things” in earnest. Roger is something of a charming curmudgeon. He finds the familiar errands of life stressful and irritating, but thinks nothing of spending an afternoon wandering the neighborhood with camera in hand. And while on these walks, he’ll find beauty in the typical trees and flowers and gorgeous sunlight of Portland, but also in the oddities—the plastic horses chained to the old carriage rings in the curb, the kitschy yard lights, sidewalk chalk drawings and the weeds growing in the parkways. He brings this same dichotomy to his artwork. Easily distracted by color, design and structure wherever he goes, he then attempts to extract the essence of form with a graphic shorthand in order to communicate his view of the world to others. And he chooses to do this with glass, a medium so belligerent and unyielding that it creates a narrow set of confines for him to work his will on. It demands whoever wishes to master it learn to work their own magic. By now, these techniques are second nature to him, enabling him to create pictorial and abstracted images while allowing the glass to voice its own true nature. He states that he wishes to know his medium as well as the Asian calligraphy master, who, after a lifetime of study, bends the ink to his desires and expresses the world in a single brush stroke. Or single kiln-firing. Roger approaches glass as a sculptural medium and ends up creating masterful paintings. 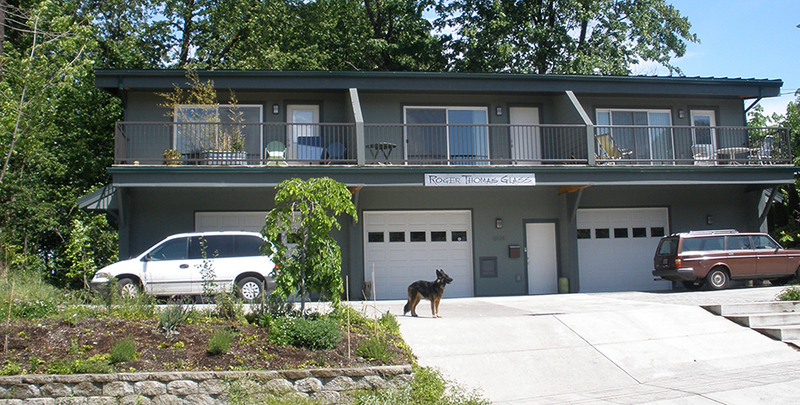 The Roger Thomas Glass Studio is located in Portland, OR on Mississippi Avenue–at the opposite end of the street from the trendy shops and restaurants, alas–and perched above a bluff with a view of the railroad yards and Mt. St. Helens. For a while, when he first moved in, he decorated the windows of his garage doors with the ID numbers of train engines, trying (in vain) to recognize a pattern and predict the pitch and tone of the next whistle. Luckily, he gave up that endeavor and went back to glass. This studio is a life-long dream of Roger’s. The space isn’t exactly perfect yet. He doesn’t have his tile-lined, drain-in-the-floor room for cold working, and his goal of putting every piece of equipment on wheels has yet to be realized (though is very, very close). However, he’s able to keep three out of four kilns running in one area and he no longer needs to use a miner’s head light in the dimmest corners to seek out the proper colored sheet of glass as in his previous basement studio. 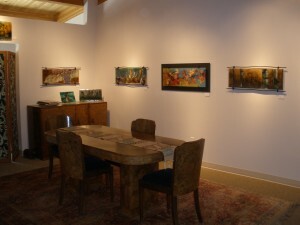 The gallery upstairs is a unique blend of those pieces that he’s unwilling to give up just yet, one or two that other galleries have returned, and the newest, most exciting works that have just come out of the kiln and are hung and admired before being sent off. Roger’s featured on OPB’s Art Beat!